Are you always looking for new craft ideas for your kids? I have two great craft books that will help. The author of both books Amanda Formaro is a mother of four kids. She has been creating crafts for kids for over 20 years and she has been published in numerous major publications. Whether you are already stuck on duct tape or just eager for fun creative projects, this book is for you! Filled with cool crafts, awesome games, surprising activities, and fascinating facts, Duct Tape Mania will make a duct tape maniac out of you! Whether you are already whipping up rubber band bracelets or are just looking for some fun creative projects, this book is for you! 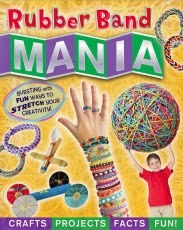 Filled with cool crafts, awesome ideas, surprising activities, and fascinating facts, Rubber Band Mania will make a rubber band maniac out of you! I would have loved these books when I was younger. I love making crafts out of simple (and cheap) every day household items. One lucky Thrifty and Frugal Living reader will win a copy of both books! **TO ENTER- Enter using the Rafflecopter below. Note: It may take a moment for the Rafflecopter to load. If you are reading this via RSS or Email, please visit the website to enter** Ends 8/17 11:59pm. Disclaimer: I did not receive anything in exchange for this post other than a prize for my readers. Any opinions stated here are my own. Duct Tape Mania would be awesome!! Looks fun! I would most be interested in making the duct tape crafts. I don't have anyone to make these crafts with. I would really enjoy these books and thank you for this chance to win. I am looking forward to both but I guess the Duct Tape holds the most appeal for me! I will be using these books to craft with my grandkids Layne and Larkyn! My kids have made all sorts of things with Duct tape. They would love some new ideas. Would love this for tween programs at the library. Love this giveaway. Excited to be able to win. Duct Tape Mania is the book for us! We love and really use the stuff. Duct Tape Mania would be awesome! My kids would love to make the crafts! Thanks so much for the fantastic giveaway! 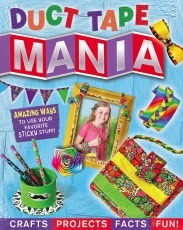 I am looking forward to trying the Duct Tape Mania book. I want to read the Duct Tape book. I'll be using these books with my granddaughter. Congrats to April,have fun with the kits. Looks like some awesome fun!